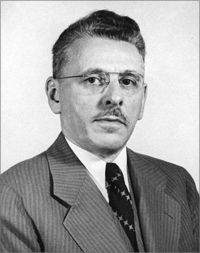 Paul D. Foote was Assistant Secretary (Research and Engineering) at the United States Department of Defense (1957-1958). Other institutional affiliations included Gulf Oil Corporation and the Mellon Institute of Industrial Research. His research interests included scientific instrumentation and the use of science by industry. March 27, 1888Birth, Andover (Ohio). 1909Obtained AB, Western Reserve University, Lincoln (Neb.). 1911Obtained AM, University of Nebraska, Lincoln (Neb.). 1911 – 1916Laboratory Assistant (1911-1913) and Assistant Physicist (1913-1916), National Bureau of Standards, Gaithersburg (Md.). 1916 – 1917Assistant Manager, Fisher Scientific Company. 1917Obtained PhD in Physics, University of Minnesota, Minneapolis (Minn.). 1917 – 1927Associate Physicist (1917-1919) and Physicist (1919-1927), National Bureau of Standards, Gaithersburg (Md.). 1921 – 1932Editor, Journal of the Optical Society of America. 1922 – 1932Editor, Review of Scientific Instruments. 1927 – 1929Senior Gulf Fellow, Mellon Institute of Industrial Research. 1929 – 1953Researcher, Gulf Production Company (1929-1933); Executive Vice-President and Director of Research, Gulf Research and Development Company (1933-1953); and Vice President, Gulf Refining Company (1945-1953), Gulf Oil Corporation, Pittsburgh (Pa.). 1957 – 1958Assistant Secretary (Research and Engineering), United States Department of Defense. 1958 – 1961Consultant, Ordnance Department, United States Army. August 2, 1971Death, Washington (D.C.). Collaborated to found the American Institute of Physics (AIP). Collaborated on work with the latent heat of evaporation of metals. Researcher, Gulf Production Company; Executive Vice-President and Director of Research, Gulf Research and Development Company; and Vice President, Gulf Refining Company. Editor, Journal of the Optical Society of America. Laboratory Assistant; Assistant Physicist; Associate Physicist; and Physicist. Obtained PhD in Physics (1917). J. H. Van Vleck selected correspondence and notes [microform], 1923-1959, (bulk 1923-1938). Spectroscopy and Bohr's theory of atomic structure / by Paul D. Foote. Paul D. Foote Physics Today obituary.